Television remote controls are evolving more than they have at any time in the past 60 years–but where we’re going, we may not need them. The question of how remote controls may change in our smartphone and tablet era is actually moot. Forget evolving them from a crazy array of buttons to a smart touchscreen UI…the TV remote may be about to achieve its Nirvana, and dissappear into the ether. It’s partly because remote control tech is about to be revolutionized, and partly because TV as we know it is about to change radically. It’s Sony’s solution to the complexities of navigating its own brand of Google TV–a connected television system that brings some of the power of your computer to the big screen in your living room. And it’s a disaster. If you’ve ever seen the flight deck of the Space Shuttle then you’ll notice the similarlty: An array of buttons, switches, sliders, letters, numbers, and obscure symbols whose meaning only the High Priests of Techdom can divine. 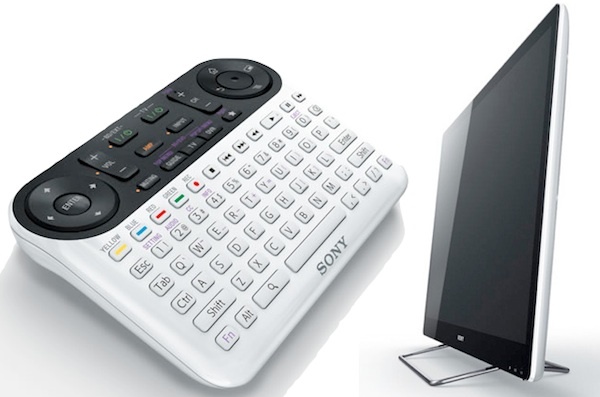 The remote’s design is Sony trying to make sense of a whole new paradigm in TV, and forcing the existing remote-control design meme into this new era. Most of these buttons are probably necessary, and they’re needed to interact with Google TV–to do things your old-fashioned TV just couldn’t do (and even then I bet that TV’s remote control still has over 30 buttons on it to control esoteric funcitonality). Before you point out that Google TV isn’t exactly a shining example of technology success, remember that starting next year connected TVs will change how you think about the entire TV experience. Connected TVs are definitely in-bound: Advertising on connected TVs–the source of the money–is predicted to soar in 2012, and players are maneuvering already. The winds of change are blowing strong: Governments are investigating; Apple is now strongly rumored to be revolutionizing the TV with a full-featured set imbued with its characteristic design and UI flair; Google has brushed up its TV offering, and improved YouTube to hint at the future of TV; streaming content rivals to traditional TV channels like Netflix and Hulu are rapidly growing their business; and TV maker peers are said to be “scrambling” to rival Apple’s still-rumored product. Thus, when your TV stops being a simple goggle-box, merely requiring you to surf through the channels to find your desired entertainment and adjust the volume (annoying how it’s always louder during ad breaks isn’t it? ), then your remote will have to change too. In fact, it will probably disappear. Businessweek reported that a number of TV manufacturers and set-top-box makers are moving forward with voice recognition control for TVs next year: Microsoft, Comcast, Samsung, LG, and Sharp were mentioned. The TV remote for some of these efforts may remain as a single button to say “listen to my commands,” but other designs see multiple microphones solving this problem and thus abolishing the remote. But while Businessweek correctly highlights the fact that voice recognition tech has now evolved so that your TV could reliably understand you saying “Record the next episode of Modern Family,” that’s kind of not the point at all. That’s just a cleverer TV and remote in the current mold. How about if you said “Play me some Mythbusters!” and your TV scoured the transmission schedules, and found you a currently playing episode? That’s interesting enough all by itself because it relegates the idea of a TV “channel” to the background–you almost don’t care where the show is coming from. And then think about this: If your TV finds that no Mythbusters episodes are currently being aired, what if it automatically showed you options to stream a recent episode, for a nominal fee? Shouting “sure, I’ll rent it” for $0.79 is then a natural human way to deal with the option. At this point, your TV has stopped being a portal to a number of channels, and has started being a vehicle for content…seamlessly. You don’t care that you’re technically renting that episode via Apple or Google, because instead all you want to see is the show. If you’re still dubious at this point, then consider Apple’s Siri. It’s derided by misunderstanding peers, and damned by its success–it seems so smart that you naturally expect it to be able to do more than it can right now. Its cleverest aspect, apart from understanding semi-natural language, is that it filters your search requests across an array of possible data sources: A restaurant advice search will deliver Yelp data, but asking it how many days is it until Christmas will query Wolfram Alpha. In the same way Siri senses context-sensitive sources for search queries, your connected TV may too–on voice demand it’ll hunt for content (a particular show, or “something funny” that it selects based on knowing what made you laugh before) from multiple online sources, perhaps even trying to find you the best deal on the same content from different providers (knowing you prefer to rent once, or are a rent-to-watch-again type). All served up via a simple spoken conversation, and shortcutting the existing TV content and channels model as smartly as Siri shortcuts web search. But that’s just one avenue of innovation. We recently spoke with the team behind Microsoft’s amazing Kinect device, PrimeSense, to illustrate how they too are trying to bring their motion-and-body-recognition tech to future TV controls. Firstly, of course PrimeSense’s plan is to bring gesture control to your TV–it’s a natural extension of the way you control an Xbox with Kinect, and a more intuitive way of controlling what your TV is up to than jabbing at a remote. How about holding your hands up to pause a streaming show, or twirling your fingers to fast-forward it? There are a few downsides, and technological challenges based on the size of your TV and its distance from you–the author Douglas Adams famously joked such controls “saved a lot of muscular expenditure”–but it would mean you don’t need to fumble down the back of the sofa to find a remote. A radical shake-up, a new paradigm, is almost necessary, he argues because “the ecosystem is really messed up. It’s not like in the gaming business where you have consoles, their publishers, and the consumer and the developers. You’re going to need a different format to browse, to navigate to create the content for your future TV because it’s going to be a mix of so many sources. As well as shows, you’ll be gaming, Skyping and so on–PrimeSense even imagines that its tech will identify you as a user, perhaps through face recognition, and deliver content in context just for you. And there you have it: If you’re watching YouTube on your TV, then searching the web, shopping for sunglasses like those in the film you just saw, broadcasting via Twitter, or seeing a picture-in-picture image of your friend on Skype or FaceTime (who you’ve voice-dialed), who’s watching the same show as you, your current TV remote just isn’t up to the task. You’d either need a full-computer interface and mouse to do this interaction, choosing content, typing in search terms or passwords… or a far cleverer system altogether. The smart money says next year you won’t be cluttering up your sofa with a 102-digit keyboard and trackpad to control your TV. No matter how much remotes evolve.